I never imagined a device as tiny at the Google Chromecast could have a such a huge impact on my home entertainment system. 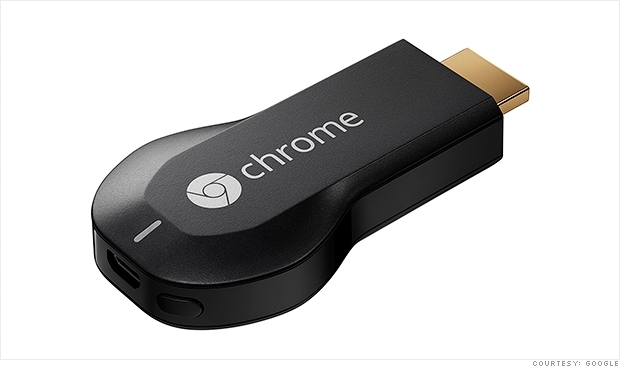 The Google Chromecast is a streaming dongle that you plug into any HDMI port of your television. The $35 device allows you to stream music and video from sites such as YouTube, Netflix, Pandora, and Google Play. By using your smartphone (iOS or Android currently), tablet, or computer as a remote control, you can enjoy your favorite music and video with relative ease. One of the best features is the fact that you can continue to use your smart device for other activities. The Chromecast doesn’t require your phone to stream music or videos to it. Instead, the mobile device “tells” the Chromecast what you want to watch and it streams from the cloud. If you want to play Candy Crush or visit social media while watching reruns of 24, have at it. The device only works with apps that support Chromecast. Besides the ones mentioned above, more streaming apps are being added to the service on a regular basis. Setup is relatively simple. You must download the Chromecast app from Apple’s App Store or Google’s Play Store. Plug the dongle into your television set and the Chromecast app walks you through the rest of the process. Make sure your TV is capable of powering the Chromecast stick through the HDMI port alone. You will need an extra USB port or power outlet to deliver juice to the Chromecast if yours doesn’t have this capability. You can also have multiple devices and multiple Chromecasts in your home. I currently have an iPhone 5S, a Galaxy S4, a Nexus 7 tablet, and an iPad set to operate as remote controls. Additionally, I have one Chromecast in our family room and one in our game room. Chromecast is connected to my home Wi-Fi so I can control any television connected to a Chromecast in my home. This is particularly useful when my kids are watching a program in one room and I want to change the channel from another room (just for giggles). Chromecast has become my “go-to” method of accessing Netflix and YouTube. No longer do I have to use our PS3 or Blu-ray Player with streaming capability. If I have my smartphone or tablet (which I always do), my favorite programming is at my fingertips. This little device packs a big punch and has changed the way we access media in my home.